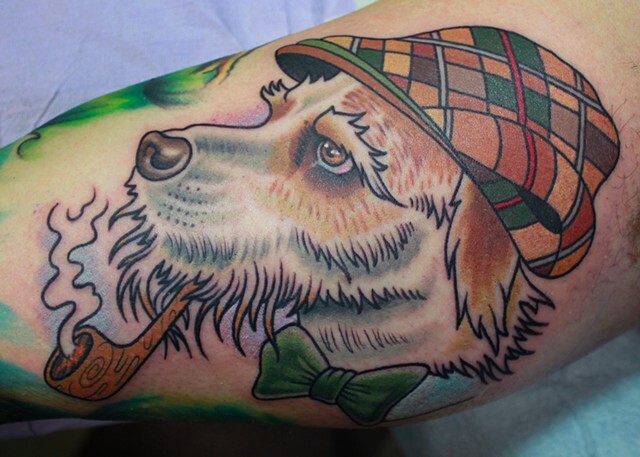 This tattoo is on one of my good friends Josh, it's a portrait of his dog Bowery. I've worked on Josh for hours and hours, mostly reworking a pretty crappy full sleeve he got from another tattooer. Although I get some satisfaction knowing I made his sleeve look way better, there's nothing like tattooing something original. He had an empty space on the inside of his arm and decided he wanted to do a dog portrait. At first I was going to approach it as a realistic tattoo and do it in black and gray, but after I traced the picture out I kept getting the feeling we could do something way cooler. It was slightly easier to add character to this portrait, mainly because I've met this dog many times. With his overgrown eyebrows and unruly facial hair, he already seems more human than dog. I'm really glad Josh took a chance and let me do this.